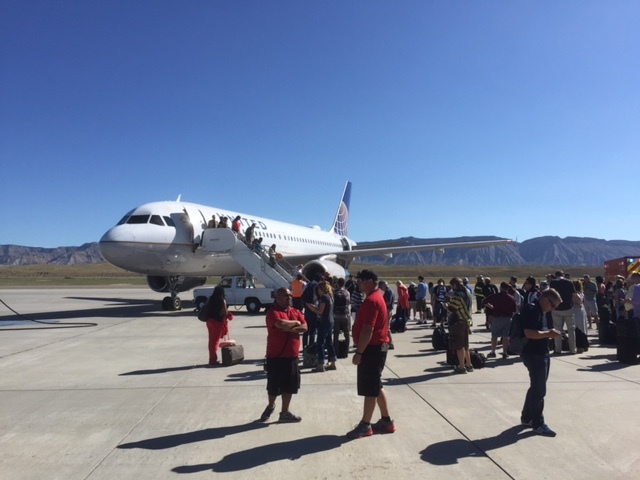 From Grand Junction Regional Airport: “At approximately 9:15AM Airport and Grand Junction Fire Department personnel were dispatched to an aircraft inbound to make an emergency landing at the Grand Junction Regional Airport. The aircraft was identified as a United Airlines Airbus 320. The flight number was UAL447. The aircraft had departed Denver at approximately 8:25am and was en-route to Los Angeles. There were 159 passengers onboard the aircraft and an undetermined number of crew members. The aircraft landed safely at approximately 9:30AM. This is the type of incident that our emergency personnel prepare and train to handle, crews arrived on scene well before the aircraft landed and made entry onto the aircraft immediately.” – Amy Jordan, Grand Junction Regional Airport Public Information Officer. The Grand Junction Fire Department boarded the plan with air quality monitors and determined that all air levels were within normal limits. GJFD evaluated 15-20 passengers who had various medical symptoms ranging from headaches to nausea. One person was transported to a local hospital for precautionary reasons. All questions regarding the aircraft will be directed to United Airlines. All questions regarding the actual incident will be direct to the Grand Junction Fire Department’s PIO @ 970-540-5858 or the Grand Junction Regional Airport’s PIO @ 970-712-4116.